In 1980, Jim Fitzgerald built a 60-cow tie stall barn after farming with his father and brothers for 24 years. In 1994, Jim began using a custom heifer raising operation to allow room for the milking of 30 additional cows. In 1997, Soaring Eagle Dairy, LLP was formed and a new 400-cow free-stall and double 12 parallel parlor was built. Two years later, a transition barn was added, allowing the herd to grow to 640 and providing a place for steam-up dry cows. 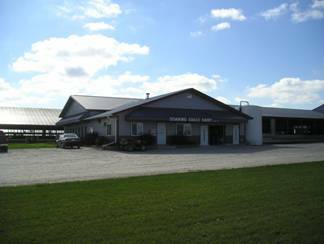 An expansion of the transition barn in 2004 provided an additional 100 free stalls as well as a dedicated maternity area. In 2005, a 2nd free stall barn and the expansion of the parlor to a double 16 will allow the herd to grow to 900 milking cows. Today, Jim and Sandie Fitzgerald along with their three daughters and their families, Kelly and Brian Goehring, Julie and Rick Maurer and Stacy and Jeremy Klotz own Soaring Eagle Dairy.